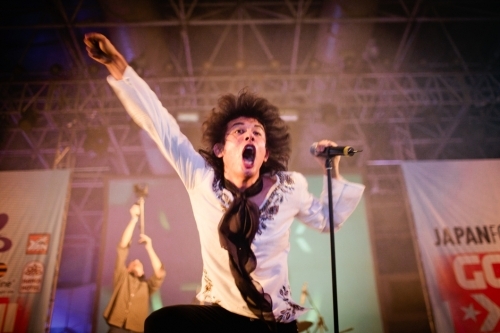 An Array of Events in Vietnam! イベントラッシュ@ベトナム! Hello everyone! I am Nha from Hanoi, Vietnam. There is a saying in Vietnamese “bận tối mắt” which literally means in English as “too busy to open the eyes”. In short, I was super busy for a series of events during the past several months. I am sorry for my long silence but I hear there is also a saying in Japan “No news is good news”. Yes! During no update from me on this blog, there were a plethora of stimulating events in Vietnam. There were more varieties of arts and cultural events but this time let me focus on reporting our intellectual exchanges. In the last quarter of the fiscal year 2011 – 2012, we conducted a series of lectures and seminars on various topics: “Railways and Modern History in Japan” by Prof. Takeshi Hara (Meiji Gakuin University) in Hanoi, Hue and Ho Chi Minh City, traveling from Hue to Danang by the Vietnamese train, DVD screening and lectures on “A Remembrance of the 3.11 Tohoku Earthquake” by Prof. Toru Takanarita (Sendai University) and Prof. Dr. Taro Igarashi (Tohoku University) which were on air on VTV1 as one of the top news on Sunday 11 March’s morning news, “Contemporary Literature and Poetry in Japan” by Ms. Mimi Hachikai (Poet/Writer/Essayist) and “Arts and Culture as the Basis of a Nation” by Mr. Oriza Hirata, one of the most acclaimed playwrights in Japan. The feedbacks to each lecture were quite positive and we are encouraged to plan more intellectual activities in near future. One of the highlights in intellectual exchanges this fiscal year was a writer’s lecture by Mr. Masatsugu Ono. 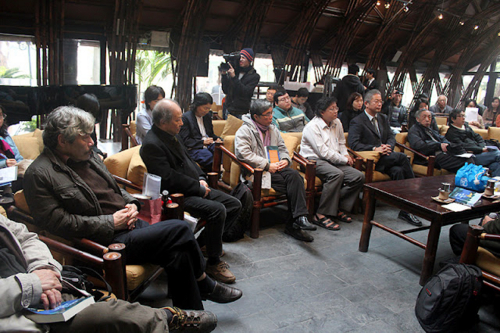 He came to Vietnam once last year to conduct his lecture on contemporary literature in Japan, focusing on the analysis of novels by Haruki Murakami and Kenzaburo Oe. 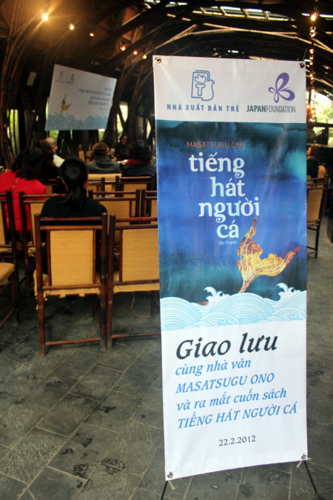 As you might know, Japanese literature nowadays becomes popular in Vietnam. 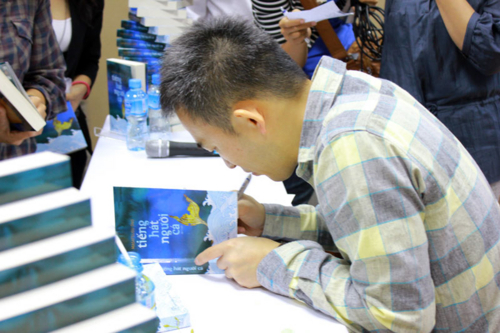 The young people are crazy for the works of Haruki Murakami and Banana Yoshimoto, the two most popular Japanese best-seller writers in Vietnam. There are about 14 books of Haruki Murakami were translated into Vietnamese in which the latest one is “What I think when I run” and “1Q84” will come soon this year with the financial support of the Japan Foundation. 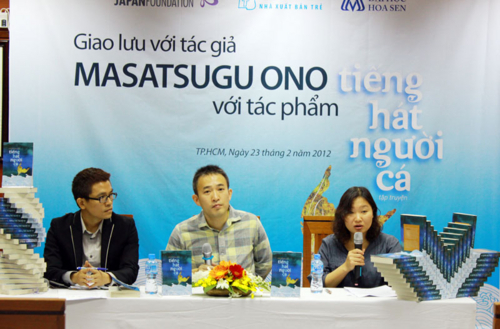 Ono’s focus on Haruki’s novels entertained a lot of professors, writers and critics, intellectually, and they also enjoyed Ono’s novel through the booklet translated into Vietnamese by the Japan Foundation. 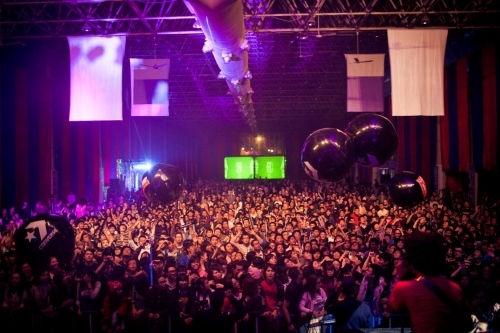 This successful lecture consequently connected him to one young editor of Tre Publishing House and Tre Publishing House decided to publish Ono’s two novels (“Ningyo no Uta [Lit. The Song of Mermaid]” and “Nigiyakana Wan ni Seowareta Fune [Lit. The Ship Piggybacked by the Jolly Bay]) and one essay in a book “(Vietnamese) [Lit. 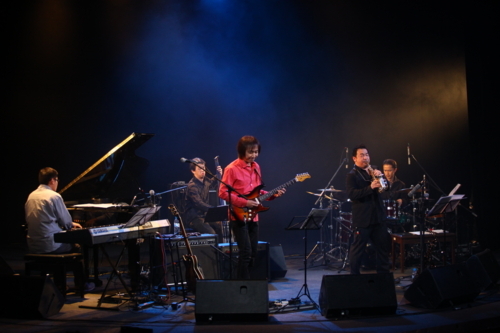 The Song of Mermaid] in Vietnamese in February 2012. That is the reason why we invited Mr. Masatsugu Ono again this year to introduce his ideas and thoughts on his novels and we conducted the press conference and talk by him with Tre Publishing House. 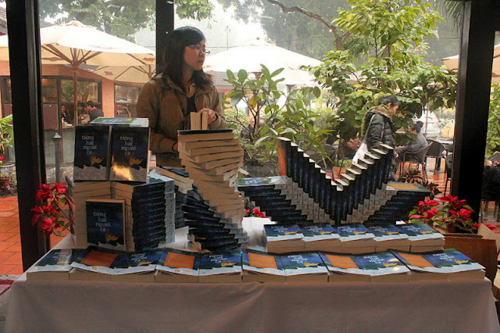 The writer was invited to Hanoi and Ho Chi Minh city to give his talk in the book releasing ceremony. 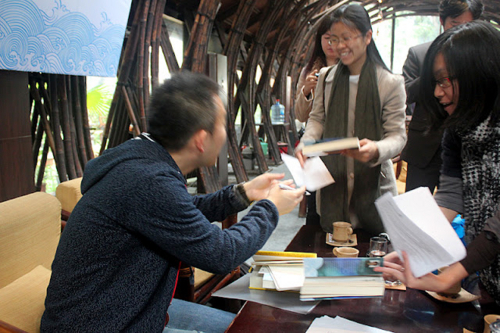 He was very happy to welcome many Vietnamese venerable writers and translators in the ceremony and discussed with him about his career and his novel. 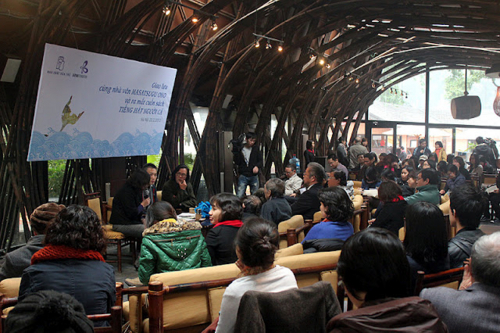 Among the VIPs, The VIP attendants include: Mr. Bao Ninh, the winner of Nikkei Asia Prizes for Literature and the author of “The Sorrow of the War”, Mr. Dang Nhat Minh (Film Director), and many other famous writers and critics in Hanoi. In Ho Chi Minh city, we had the ceremony happened in the campus of Hoa Sen university then a haft of our audience was students. A lot of discussion were made between audience after Ono’s talk. 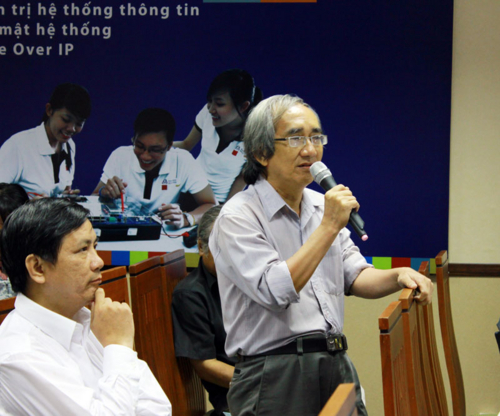 In which, the most impressive one was from Nhat Chieu sensei, a long-serving Japanese literature researcher. He gave Ono’s book his best comment for myth in the novel “Song of Mermaid”. He stated that the talent of Ono that made that reader think the mysterious details in the novel are as real. Receiving such friendly reviews help us more confident in introducing more Japanese writers to Vietnam in order to let Vietnamese readers approach to the variety of Japanese literature. 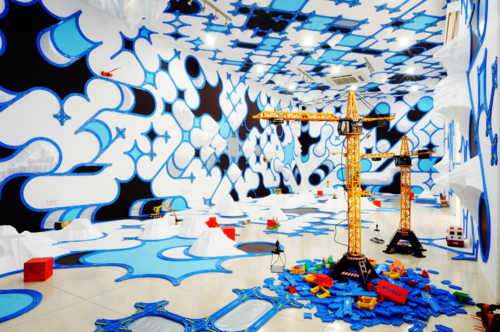 Wow, it is too long already and I hope the blog editor team will not mind to translate it into Japanese. Let consider it as my compensation for not writing for months.